This weekend we celebrate the Solemnity of Saints Peter and Paul on June 29. Sts. 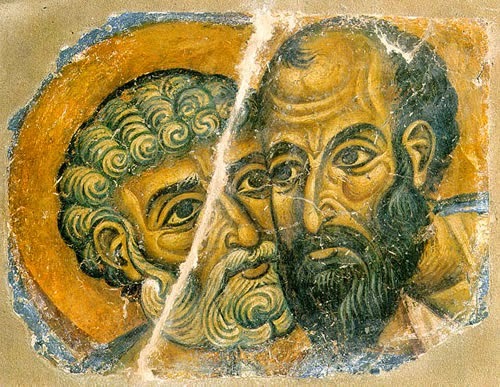 Peter and Paul are two great companions and spiritual brothers. In fact they are often called the founding pillars of the Church. In this brotherly dyad Peter is regularly read as the rock, the steady one at the center, the leader of the Jewish Christian community in Jerusalem and Antioch and Rome. And Paul, then, is the one sent to the margins, the peripheries, to bring good news to the gentiles in Galatia and Athens and Thessalonica. But just like most brothers – and just as other passages from both the book of Acts and another of Paul’s letter tell us – they also ran headlong into conflict with one another. Take Galatians for example. There Paul writes, “and when Cephas [Peter] came to Antioch, I opposed him to his face because he clearly was wrong.” There it is, plain as day. Conflict between the saints we celebrate on a single day. Even more, this wasn’t the first time Peter had been called to conversion. And then Jesus calls Simon not Peter, the rock, but “Satan,” the tempter. What happened in the thin gap between those two names?